"A warm, flavor-filled dish that can be prepared far in advance. A good pick for large groups, or small dish that's not too heavy of a dinner. It can also be varied in several ways. This dish does not need to be cooked and can be served cold." Combine chicken, mayonnaise, celery, water chestnuts, almonds, pimento peppers, dried onion, lemon juice, salt, and pepper in a 2-quart casserole dish. Top with Cheddar cheese and French fried onions. Bake in the preheated oven until hot and bubbly, about 30 minutes. 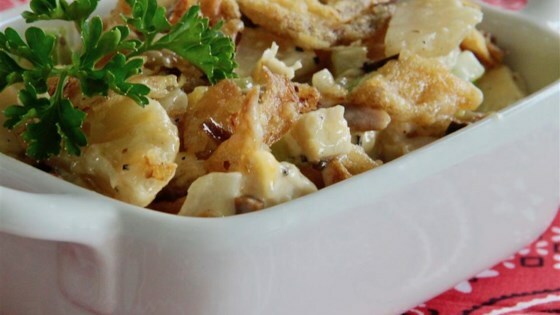 Check out this Texan-inspired chicken casserole. Could be very good but too much mayonnaise - I would half the mayonnaise at the very least. It's delicious but I could be sick off of mayonnaise alone.